I initially wanted to post my take on Marcus Tanner's peculiar piece (insofar as it was surprisingly common-sense from someone who's spent years promoting the Official Truth) for The Independent, but it turned into a regular column, which can be found today at Antiwar.com. Now that the Empire has come full circle, from Clinton's "humanitarian interventionism" through Bush's "war on terror" to Obama's "we're here because I say so," it may be time to look beyond the bogus labels of left and right, and realize that Antiwar.com has been among only a few organizations that has consistently opposed the Empire on principled grounds. If you, too, oppose the perversion of true American values that is the Empire, if you are against murder, theft and enslavement, your choices at the ballot box are next to nonexistent. However, you can still vote with your wallet. I suggest you do so. "It was as if senior Russian officials pulled out a dog-eared Soviet propaganda playbook that called for hurling the most outlandish charge, without recognizing that in the modern global media climate, their credibility would quickly suffer if the facts proved otherwise." If this weren't coming from the newspaper of Walter Duranty, Jayson Blair and Judith Miller, I'd be less inclined to laugh hysterically. Not to mention that I find it comical in the extreme that any American newspaper dares criticize anyone else for outlandish propaganda, after the "WMDs in Iraq" or the "genocides" in Bosnia and Kosovo. Why, it was the war crimes "tribunal" established by the American Empire that defined "genocide" so it could mean anything at all! Would the NYT say its own credibility, or that of the White House or the ICTY, has been in any way impugned when facts got in the way of these ridiculous claims? No, because when Imperial propaganda is exposed as lies, those doing the exposing are branded kooks, deniers, conspiracy theorists, delusional ultra-mega-super-hyper-nationalists, people with a victim complex, etc. Mistakes were made, nothing to see here, pay no attention to the naked Emperor, move along. Levy even drags Kosovo into the discussion. You see, Russians were just peeved the NATO-occupied province "won its freedom" (his words) from those dastardly Serbs, so they decided to retaliate. But of course, Kosovo was an entirely legitimate, legal, proper and praiseworthy intervention-occupation-separation, a completely unique case and nothing like anything the Russians did, because it was supported by America, you see. Now where have we heard that before? Ahh, yes. Fourteen years ago, the Croatian government launched a "police action" aimed to "re-establish the legal and constitutional order." Croatian troops were trained and equipped by the U.S., in direct contravention of the UN arms embargo. Their "policing" involved the displacement of 15o,000 people, complete destruction of their towns, villages and farms, and the murder of some 2,000 people who did not manage to get out in time. At the end of the operation, the Serb population resident in the area since the XVII century had ceased to exist. The American ambassador in Zagreb defended Croatia's actions, saying they could not be classified as "ethnic cleansing" since that is something only the Serbs do! Fast-forward to 2008. Georgian troops, trained and equipped by Washington, launch an attack on South Ossetia for the purpose of "re-establishing the constitutional order." They attack peacekeepers and civilians and leave behind a trail of destruction. The parallels are uncanny, really. 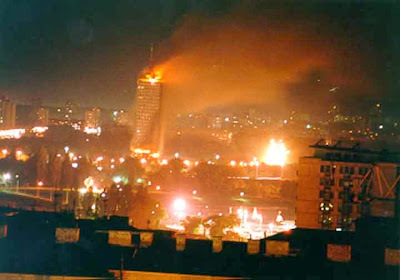 There is no way of knowing for sure what would have happened had the Russians not reacted, but odds are it would not have been much different than the Croatian "police action" 13 years prior: Ossetians displaced, their homes and farms destroyed, and Saakashvili declaring a public holiday of thanksgiving. And the New York Times would not have considered it genocide, just as didn't qualify the destruction of the Krajina Serbs as such. So much for the Gray Lady's "credibility," then.